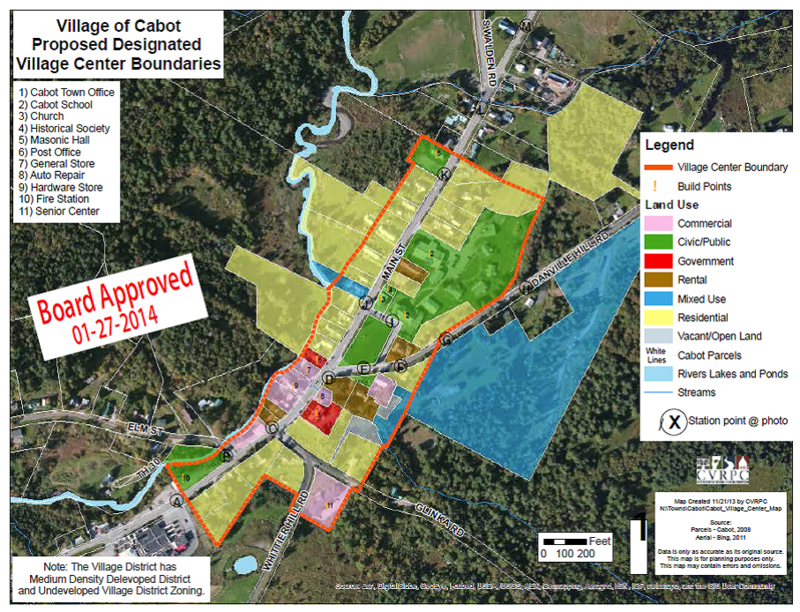 The Downtown Board officially approved Cabot Village in the Town of Cabot as a Designated Village Center. Congratulations to the Town of Cabot for successfully completing the application and approval process to designate this village that has and will continue to serve as the economic and civic hub of the community. Below is the approved Village Center Boundary map outlining the various uses within Cabot Village. The Caring for Canopy grant category is for projects focused on helping a community move their tree management program forward towards a sustained level. This could include: street and park tree inventories; canopy assessments; management, protection and streetscape plan development; public policy development, training opportunities, tree planting, and tree maintenance. Grants range from $500–$5000 and require a 50–50 match (total project cost range is $1,000–$10,000). The Canopy Mini grant category is for smaller projects that a community wants to accomplish. This could include: Arbor Day activities, tree purchase, in-house training, promotional material, equipment, or reference material. Grants are up to $500 and require a 50–50 match (maximum total project cost is $1,000). Grants are due April 11, 2014. Contact Danielle Fitzko for more information. The Town of Washington and Central Vermont Regional Planning Commission have drafted a Local Hazard Mitigation Plan, a copy of which is available for review at the Town Office and at the below link. The purpose of the plan is to assist the Town of Washington in recognizing hazards facing the region and the community and identify strategies to begin reducing risks from acknowledged hazards. The long term and overall goal of this plan is to protect life and property from harm/damages caused by natural and man-made disasters. View a PDF of the draft Local Hazard Mitigation Plan here. 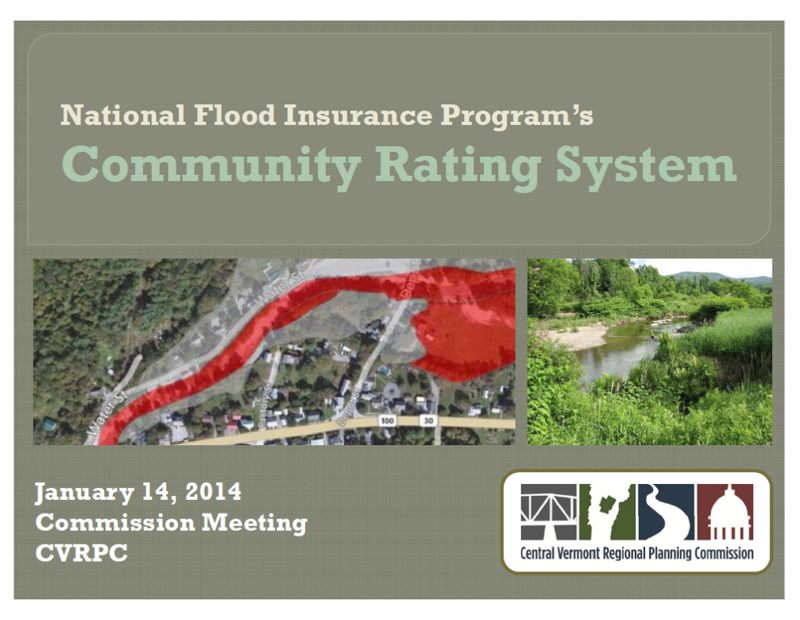 The presentation and accompanying hand-out from CVRPC’s January presentation on the National Flood Insurance Program’s Community Rating System (CRS) can be downloaded here or by clicking on the image at right. Also available are a FEMA CRS Factsheet (2012) and a CVRPC CRS Information Sheet outlining possible assistance opportunities for your community from the Region. If your community is interested in getting started, the CRS Quick Check spreadsheet can be downloaded here and be sure to look into free trainings available both online and at FEMA’s Emergency Management Institute in Emmitsburg, MD. The Department of Emergency Management and Homeland Security just released a useful summary of the ERAF (Emergency Relief and Assistance Fund) rule defining the state-recommended mitigation measures for towns to become eligible for state funding on the match required for FEMA Public Assistance grants. Kari Dolan, Ecosystem Restoration Program Manager with the VT Dept. of Environmental Conservation will be doing a presentation at the January 14th monthly Commission meeting on the Lake Champlain restoration plan. The purpose of the meeting is to share information and discuss the plan (i.e., the Total Maximum Daily Load or TMDL). 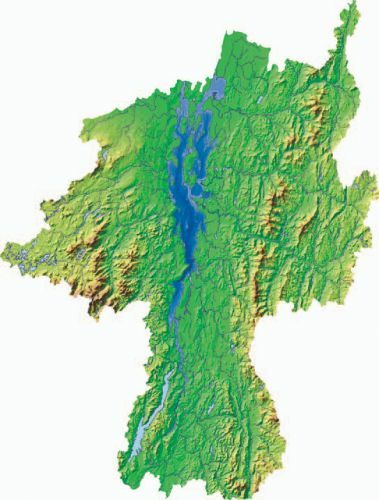 She is specifically interested in discussing the draft Proposal for a Clean Lake Champlain that pertain to road and stormwater runoff. (Please see the attached document and information on our website: http://www.watershedmanagement.vt.gov/erp/champlain/).